Today is the day that poet/novelist/nonfiction writer Mark Yakich will be at Dog Ears Books from 2 to 4 p.m. Mark is coming all the way from New Orleans, so please turn out to give him a warm Northport welcome. Format will be readings interspersed with questions and casual conversation with the author. A golden opportunity for my local writer friends! Also today your small town bookseller was quoted in the national newsletter "Shelf Awareness." My 12 seconds of infamy! It's a little easier to find us now. 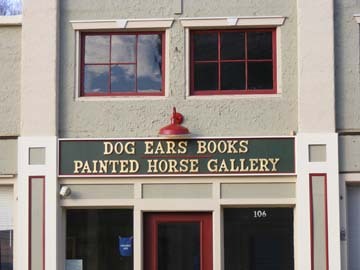 Our door is still under the word LAW, but it says BOOKS on the door, and over the awning is our new DOG EARS BOOKS sign. Summer is here, and summer is nonstop. Business, household, grounds and gardens, young dog, married life, social life – all surge forward simultaneously, paths often crisscrossing, obligations at times colliding. There is a lot to do at home, taking care of lawn, flowers, fruits and vegetables. Then it's back to Northport, with an author event at Dog Ears Books. Last Sunday it was Bob Underhill, with his new murder mystery novel. 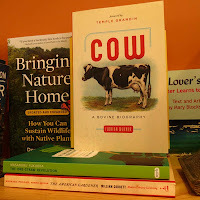 On Monday evening I got all the way to Traverse City with a friend, to the National Writers Series at the Opera House to see and hear author Temple Grandin. We were able to arrive an hour early, which gave me an opportunity to photograph the venue for its architecture before crowds filled it up. Not bad from the very last row in the way-back balcony, where Susan and I had scored the last two available seats in the house! There is a lot more going on in Northport (and in Traverse City, of course) with new businesses and summer events, and I have more photographs, also, and I've been reading, too, and have a lot to write about a few books -- some new, some not -- but time waits for no bookseller, and I have not been to the post office since Saturday, so forgive today's rush of pictures without captions. Reminder: This coming Friday, June 28, we are having a poet who's coming all the way from New Orleans. Mark Yakich will be reading and conversing with bookstore guests from 2 to 4 p.m. It's a new time slot, never tried before, chosen to accommodate a few people who requested afternoon rather than evening. Hope others can make it, too. I haven't met Mark yet, but his writing is riveting. 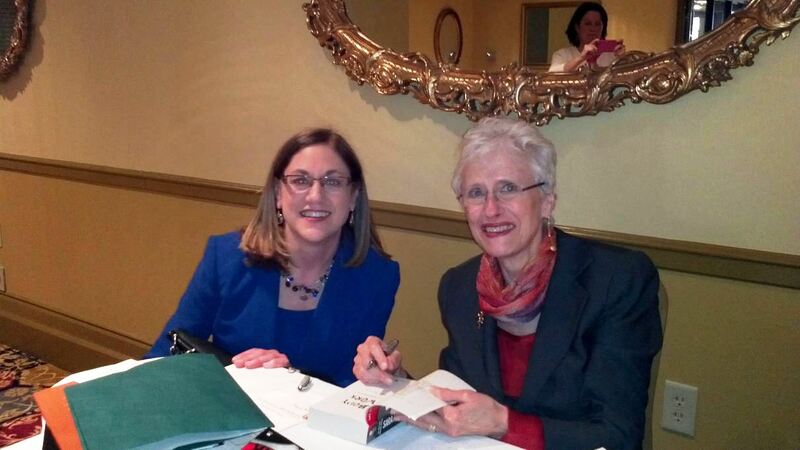 This spring my sister had an opportunity to meet, in person, Chicago’s Sara Paretsky, creator of the popular W. I. Warshawski novels, in which a feisty female detective (divorced, loves dogs, hates cooking and housework) negotiates the southwest stretch of Lake Michigan shoreline -- urban neighborhoods, scary alleys and industrial settings -- the works! Warshawski takes risks, confronts danger head-on, and brings wrong-doers to justice. It turns out author Paretsky and her husband honeymooned in the Sleeping Bear area (before or after Lakeshore status? I don’t know), and she loves the whole Leelanau/Grand Traverse area. I wonder if she has any idea of the number of fictional murders that take place in these beautiful surroundings. I like puzzles. "Who done it" is a puzzle that has to be answered. Our moral code demands an answer where murder is concerned. A reader is easily convinced of this. Why did Jane decide to become a nurse, is an interesting question, but halfway into a book about the subject one may think, "Maybe I don't need to know that much." A mystery novel fan has to know the who, how and why about a murder. As a kid I read Nancy Drew, and then all of Sherlock, then all of the British classics. It was relaxing, non-demanding reading at bedtime after a busy day. One day I complained to Trudy [his wife] that I couldn't find a good mystery of the puzzle type I enjoy, and she answered, "So, write one yourself." A project suggested itself: I have enjoyed so many pleasurable hours with a good mystery -- why not try to write at least one book that would provide a reader with my taste a "good read"? It would serve as a sort of payback to all those who had put in the time that I'd benefited from. I set out pleased with the project, but with no promise of success. As it has turned out, I had the pleasure of having a number of people approach me to say that I had accomplished my goal. I also found that I really enjoy writing. Why Leelanau? Most would say that writing about what you know affords the best chance of creating a convincing fictional world. Aside from Leelanau, I've written a novel set in Chicago - with which I am acquainted, one set in Ann Arbor -- ditto -- and my last book took place in Appalachia, where I once lived. It should be pretty clear to locals and county visitors from the title of Underhill’s new book, Suttons Bay, that it’s set close to the author’s Leelanau County home. Elizabeth Buzzelli, author of the popular Emily Kincaid series, shared Underhill’s perspective in part and also gave a surprising and striking response to one of my questions. That is, she doesn’t think murder in northern Michigan is all that unlikely or uncommon! Read on, if you dare! Ah Pamela, murder is not as rare as you might like to think in our pleasant North Country. The problem was, until recently, a distinct lack of law enforcement, or even collusion by law enforcement. Since moving up here I have been treated to story after story of where the bodies are buried, with the miscreants never brought to justice. I have one story -- which I'm considering as background for a future Emily Kincaid book -- about a mother and son who took in indigents during the winter, murdered them, and buried them in their basement. 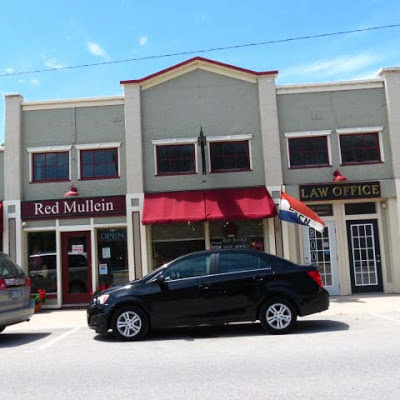 That site is now a paved-over parking lot in Kalkaska. And stories from a retired psychologist . . . well . . . shall we say, murder is no stranger up here. Winters are long and dull, you know. Now, as to how I got involved in murder. My mother was a voracious mystery book reader. Some of that must have rubbed off on me. And then the nature of murder -- since Cain and Abel, a crime inducing the highest horror. The act inspires not only fear, loathing, and reprehension but seems to reach down into that bottom-of-the-soul place where we all fear we might go--given the right circumstances. Murder is sin at its worst -- where a person's right to continue living is taken away. To solve a murder, to bring a murderer to justice, is to set civilization back up on its feet, to make the world a good place again. What better task for a writer than to set all of humanity to rights? To scare future murderers with apprehension? And to have a heck of a lot of fun undoing dastardly villains. Anyone who has ever met Buzzelli or heard her talk about her writing knows how much fun she has concocting her stories and punishing the wicked! Buzzelli’s novels starring Emily Kincaid and sidekick Deputy Dolly all take place in and around Leetsville, a fictional Up North town. Underhill’s, as he points out, range from Leelanau to Ann Arbor, Chicago, and Appalachia. A local newcomer to the lists of northern mystery writers this spring is Berkley Duck of Leland, whose first novel is entitled The Grapevine. Here’s his take on my questions. I wanted to try my hand at fiction. I picked the crime novel genre because I enjoy it as a consumer and because generating characters and a story line seemed manageable in this format: a crime occurs, the protagonist gets involved (usually bringing some particular expertise to the task), he (or she) gets help from a sidekick of some sort, there may be a police procedural element, etc. All the writer has to do is fill in the details. Murder because you need a crime (obviously), and you need a crime that, presented properly, causes the reader to catch his or her breath: “Wow! I wasn’t expecting that! What just happened? I liked that character.” And so he or she reads on. Murder resonates with everyone. The Grapevine is not set in Northern Michigan (although the principal characters find themselves there eventually). Most of the action takes place in a large, unnamed city in the Midwest, a setting dictated in part by the plot but also one with which I was familiar having lived and worked in Indianapolis. Readers like to identify with the story locale, and verisimilitude is important. I have been told by readers of The Grapevine that they recognized places in which the action takes place even though I made them up. I intend to write another crime novel, and one in which more of the action takes place in northern Michigan. Murder? Of course! So there you have it, from the horses’ mouths: crime, puzzles, characters, setting, justice. How does the apparent embezzlement problem in a community symphony organization take a turn toward murder? Why would anyone take a shot at Deputy Dolly’s car while she is visiting an old grave at the Leetsville Cemetery? And what if a psychiatrist, listening to a patient’s description of how he would kill another person, takes as fantasy what is actually a plan? For answers to these questions – and all the others that will occur to you as you turn the pages of these mystery novels – read The Grapevine, by Berkley Duck; Dead Little Dolly, by Elizabeth Kane Buzzelli; and Suttons Bay, by Robert Underhill. All are at Dog Ears Books now, and very soon we will also have for you Aaron Stander’s latest Ray Elkins mystery, Death in a Summer Colony. Hot Date: A book signing and reception for and with Robert Underhill and his latest mystery novel, Suttons Bay, will be held at Dog Ears Books on Sunday, June 23, from 3 to 5 p.m. Please do not be confused: the book title is Suttons Bay, but the signing will take place at my bookstore in Northport! Writing with pen on slightly porous paper of a yellow legal pad is a meditative practice. The letters are not preformed but flow from the pen guided by movements of my hand. This is the way I compose letters to friends. ‘Way’ is a friendly word, bucolic and summery, its sound and associations nothing like those attached to the word ‘method.’ The latter, analytical in tone, suggests procedure, perhaps scientific procedure in a laboratory, the former a rambling country path bordered by wildflowers, perhaps also a low stone wall and grazing cattle or sheep beyond. ‘Method’ constrains, ‘way’ invites. My yellow paper and black pen invite discursive thoughts. They also invite lists. Or poems. – Or at least fragments and phrases that give hope of turning into poems. The poet who was at the bookstore on Friday last held the small assembly enthralled. If I could go back in time, I would have a camera person and equipment there to capture the entire presentation and conversation. One attendee, himself an accomplished poet, took copious notes. Is there any chance, I wonder, that he would write up his notes for me? Because I can’t remember – what exactly did Mary Ann Samyn give as the reason she forbids her students rhyme in their work? I remember the sense but not the clear, succinct, one-sentence expression she used. Here the lines stop, the thought unfinished, the moment past. When two poet friends came all the way from Eastport – we have no ferry across Grand Traverse Bay, so they had to drive south and through Traverse City and then back up along the shore to Northport – I was struck once again with the generosity of writers in supporting other writers and supporting bookstores. This was in addition to the generosity of guest poet Mary Ann Samyn in giving her time, attention, encouragement, and insights to a roomful of strangers. It is the greatest privilege of my bookseller life, meeting these lovely people. I only wish more bookstore friends, especially my writer friends, could have been with us. Dog Ears Books is not the only Leelanau entity celebrating a 20-year anniversary in 2013. After a last round of thanks and good-byes on Waukazoo Street, David and I made our way up to the NCAC (Northport Community Arts Center) for the 20th anniversary concert of the Leelanau Children’s Choir and Leelanau Youth Ensemble. When director Margaret Bell first started this group, she had fewer than a dozen young singers – and only a single boy in the ensemble. I only took this one shot of the younger group onstage – I was there to enjoy and celebrate, not to document – but other numbers crowded the stage with all ages, in more fantastic costumes, and the singing was simply wonderful. “I enjoyed every minute,” David said afterward. What a gift to the community Margaret Bell has given all these years! She, being Margaret, gives all the credit to the students, their parents, their accompanist, the board, costumers, and everyone else who contributes to the success of the productions. And it’s true that many people play a part. It was a long day, and then Mary Ann was gone, and the concert was over. Two events long awaited, slipped from future to brief, shining present to past. Iris are blooming in gardens. In meadows it is the time of composite flowers – daisies, hawkweed, goat’s-beard and such. Baby birds are leaving the nests. Non-native but beautiful black locust is in bloom, right now, today, but only for a brief time. Last night, as what I like to call “our intrepid Ulysses group” celebrated Bloomsday, orioles fluttered around the hummingbird feeder just outside the window. Near the end of our discussion of Portrait of the Artist as a Young Man, someone made the point that James Joyce, in choosing the name Dedalus for his protagonist and in addressing the mythic Dedalus at the end of the book, has chosen a new father for himself and announced his ambition to soar. We all know what happened in the myth -- Icarus flew too high, too near the sun, with his fabricated wings; the wax melted, and he fell to earth. The myth of Icarus is almost always taken as a metaphor for overweening ambition, but it struck me for the first time as I listened that -- well, perhaps I can make it an Aristotelian point. Many things for Aristotle, actions or even emotions, are not right or wrong except in context. And so perhaps Icarus was not wrong in being ambitious but wrong in what he wanted to achieve. And maybe what was wrong was his wanting to leave the earth. Our home, our only home, I thought as I watched the orioles. It is so lovely here! Life is short, and we like to say that art is long. How long will be the life of the earth? No matter. We’re here now. We’re here now. We're here now. Poet Mary Ann Samyn, who will be at Dog Ears Books this coming Friday, June 14, from 5-7 p.m., commented in an e-mail that she thinks people have a lot of questions about poetry, and the question I’ve used as the heading for today’s post is one she realizes many people have. Why don’t poems rhyme any more? What are they about? How are you supposed to know? Here is a short poem from Samyn’s most recent collection, My Life in Heaven. Painted dappled light, useless, mostly. I walked from one lake to another, not choosing. covering themselves: “Good night, good night. Mid-afternoon: what’s not to love? The dunegrass sways, and is sharp. It was Mary Ann also put into my head the idea of presenting several of this season’s bookstore events as conversations with visiting authors. “Ask the Poet” pretty much gives the audience free rein. How the poet answers will be up to her, obviously, but I’m sure it will be interesting. Samyn is the author of four previous full-length collections of poems. She is Bolton Professor for Teaching and Mentoring at West Virginia University, where she teaches in the MFA Program in Creative Writing. She comes to Glen Lake most summers. What do you want to ask a poet? Think about that between now and Friday. A colony of Canada Mayflower (also called false lily-of-the-valley) above. No more trillium, no more trout lily, no more Dutchman’s breeches for another year. Jack-in-the-pulpit is still flowering in some areas, I discover, but finished in most. There are a few violets, but the majority of the baneberry blossoms are already going to berries, and the leaves of the leeks are lying flat on the ground, empty of their green. The forest canopy is filling in, and, for the most part, the season of woodland wildflowers is over for another year. I hope as many of my friends as possible were able to get to the woods this spring. Here is a closer shot of Canada Mayflower, Maianthemum canadense, a member of the lily family. It was blooming in Houdek Dunes at the same time as the lady’s-slippers. It was a feature in the Book Review section of the June 2 Sunday New York Times. Various writers were asked to recall their most memorable summer reading experiences. For most of the contributors, the “most memorable” turned to be a book read in their teens or 20s. Without going back to high school summer vacation reading, I remember a few summers each of which was partially defined for me, in retrospect, by a single book. What does it take for a book to stand out like that for someone who reads many in every season? It cannot be one devoured in two or three days or even a week. Instead the story must be one the reader enters and re-enters for many weeks, until it becomes like that season’s second life, and at least four summer readings like that stand out in my adult life. During one year I worked fulltime in the office of a university department that was completely alien to what I felt should be a university experience, so naturally, I felt like the alien in the environment, and during my 45-minute lunch breaks I’d take my brown bag and a fat paperback novel outdoors to sit on the ground in the shade of a sweet-smelling pine, losing myself in another world. That was the summer I read Gabriel Garcia Marquez’s One Hundred Years of Solitude. A fellow sufferer of the same malady in another building told me, “It’s wishful thinking!” Yes, it was, and it was the best part of the day, and the book lasted me a very long time! Then there was my first summer in Paris and the long, dreamlike experience of reading, in French translation, the incomparable Milan Kundera’s story set in Prague, L’insoutenable légèrté de l’être. Without a lot of money to spend, I would ride the Metro to a stop near the Parc Monceau, book in my bag, and choose a bench with care, then immerse myself in the story. When I’d had enough sun or the shade became chilly or I simply needed to get up and walk a bit, I’d move to another section of the park. That summer, with The Unbearable Lightness of Being, I commuted between Paris and Prague on a daily basis -- not to escape Paris, but simply for le plaisir de le faire. It was unforgettable. After saying proudly, year after year, “Life is too short to read Proust,” one summer at the bookstore I fell into Combray, the first volume of Remembrance of Things Past. I was lost! And to think this pleasure was one I had rejected for so long and might never have had! The long, voluptuous sentences, the detail of memory, the importance of the smallest things in a child’s mind – I was carried back to my own early childhood and at the same time freshly obsessed: I wanted hawthornes! I had to find them, see them, introduce flowering hawthornes into my own life! The first postscript to this summer was my failure to be similarly charmed by the second volume (I love Paris but was bored senseless by the life of society described by the narrator), but that wasn’t the end, either. Another year -- second postscript -- I picked up the final volume, The Past Recaptured, and there was the magic again. I am not the first, a friend’s friend tells me. He has been a lifelong scholar of Proust and says that many people read only the first and last volumes of the multivolume work. It's entirely probable that I will never finish with Proust, as long as I live, and that's just fine. Now we come to the recent past, so recent that my fourth very memorable summer-read book is one that came into my life since I began “Books in Northport,” and I wrote about it here in my blog. That means I don’t have to do it again but can simply put a link in for those interested. In fact, I think I won’t even put the title here. Whoever’s sufficiently curious can follow the link and learn of the other world I inhabited one June not all that long ago. Was there a summer you lived an alternate life in the pages of a book? Where were you, and what was the book? 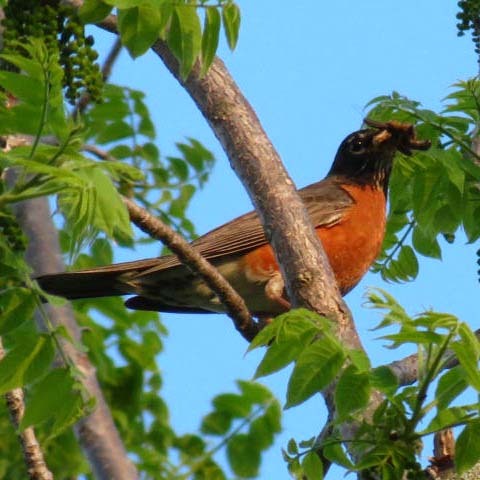 A few mornings back, a friend e-mailed me one of his poems-in-progress, one in which he, the writer, is “condemned to earth” while crows and even tiny sparrows have the power of flight. One does not argue with a poem. A poem is not an argument. Yet I couldn’t help thinking that I would not trade places with the highest-soaring of birds. It is they who are “condemned,” in my eyes, year-round, to a constant and often uncertain search for food. But do they feel condemned? Jealous of other beings? Surely not. Surely they are incapable of such feeling, of comparing the lives they have with lives they cannot have, and in that incapacity must lie their true freedom. Then came into my hands a most unusual little book, only 16cm tall and 12cm from spine to fore-edges. Its unusual nature is extended by the fact that it is two books in one: Hold it one way, and you have one title and author’s name; flip it over, and read words announcing a different title and author. Read from either cover, and midway you must stop, flip the book over, and read from the other cover back to the middle. The book is Checking In/Checking Out (New Orleans, NO Books, 2011), and the authors are Christopher Schaberg (Checking In) and Mark Yakich (Checking Out). The subject is human flight – airplanes, flying, airports – fear, security, danger, and the everyday work involved for support personnel, poetry, reading, ecology, and evolution. Schaberg loves flying and will fly stand-by, via any circuitous route, anywhere in the world, it seems. Yakich approaches unavoidable air travel with clammy hands and imaginings that all his attempts at meditation cannot subdue. But there is so much more than elation and fear in these first-person essays. Yakich brings musings on poetry and books and reading to thoughts and memories of air travel, while Schaberg, equally unrestrained by gravity and location, suggests that airports have their own ecology and that air travel is part of evolution. It occurred to me that this sort of counted as an evolved form of migration: the snake had found a rather quick way to a new bioregion. And then it dawned on me that, strictly speaking, evolution encompasses everything that happens; there’s no getting outside it. Airports are a human phenotype, and other creatures interpenetrate these techno-cultural spaces, showing them to be actual ecosystems, through and through. Like flying itself, reading connects me to others through space and time. Particularly on take-off, reading helps because it’s the one thing about the flight that feels in my control. Checking In/Checking Out is, physically, one of the littlest books I have ever read. Its font is miniscule. And yet, in the course of its 100 small pages I took multiple wild flights, imaginary and speculative. Because it’s the way my family always did things, the way I grew up, I buy newspapers, read books on paper, and write letters to mail at the post office, preferably with beautiful or at least interesting stamps. Because my father (civil engineer), grandfather (train engineer), and two great-uncles (one a train engineer, the other a conductor) worked for railroads, our family took trains wherever we went, from South Dakota to Illinois, to Ohio, and to Florida, at a time in American history when other vacationing families were driving the new, wide postwar highways and staying at Howard Johnson motels. For me, the best part of flying -- which is otherwise, let’s face it, a lot of hassle and inconvenience, not to mention discomfort – is the view from the window, the view above the clouds, above mountains, fields, rivers and cities. But then, despite the charms of dining car, cone-shaped paper cups to fill at the drinking fountain, cunning little sleeping bunks, and miniature sinks, my favorite part of riding the train, too, was the always-changing view out the window. Yet earthbound, my imagination was unrestrained and subject to wild flights. If you don’t believe me, ask my younger sisters, captive audience to my long-ago railroad story-telling. But more important is the news that Mark Yakich will be at Dog Ears Books on Friday, June 28, from 2-4 p.m. Writer of fiction and poetry, as well as nonfiction, he's coming to us straight from New Orleans, so plan to be on hand for fascinating conversation and riveting poetry. More about this in the weeks ahead. I am an inveterate re-reader. This is, in some ways, a handicap for a bookseller and would be a real problem for me if I sold only new books, because, as people sometimes ask, “How can you keep up?” and the answer is that I can’t. A quick search for book reviews here since the first of the year will show that I do not ignore new books; on the other hand, reaching for old ones keeps me from being familiar with all the current best-sellers. For instance, I have yet to read The Kite Runner, let alone the author’s latest book, a single glaring example that should serve to illustrate my point without a long, embarrassing-myself list. So there’s my “Books Read” list, and there’s Ellen Airgood’s South of Superior again, read for the third or fourth time. There’s a Barbara Ehrenreich title read twice already this year (and the year less than half gone). There are titles by Ernest J. Gaines that came out years ago – these not re-read but discovered by me for the first time and only because I do not read only new books. Already I yearn to re-read Bonnie Jo Campbell’s Q Road and Once Upon a River and the indescribably vivid short stories of Katey Schultz in Flashes of War. Valerie Trueblood has a new book coming out very soon, her third. I have it back-ordered but meanwhile, while waiting impatiently, I began re-reading her first book, Seven Loves (2006), a nonlinear novel. The novel tells the life of the main character episodically rather than chronologically, and what strikes me on this re-reading, since I already know the “end” of May’s story, is the poetic economy of the writing: nothing is missing, and nothing is extraneous. I am in awe of flawless writing that proceeds so quietly and modestly. Many fiction readers seldom if ever read poetry. There must be devotees of poetry who miss a lot of new short story collections, too (Trueblood’s upcoming publication is a collection of short stories), and a lot of people who love novels don’t give short stories a chance. But is there a reader alive, I ask myself, any lover of writing excellence, who could resist Seven Loves? It’s hard for me to dog-ear books any more, and I’ve kept my copy of Seven Loves pristine for all the years I’ve had it, but the other night, well into the book (p. 130), I finally gave in to temptation. Only a small sample --. The thoughts and impressions of one mind, at different times of life, a rather ordinary life – but oh, how extraordinary the life of that mind’s expressions! May was a teacher for years and after her stroke is thinking back to papers her students wrote. One perennial favorite topic, she recalls while looking through an old encyclopedia, was bees. She studied the head-on enlargement of the worker bee’s face, the giant badge eyes, blind-looking, innocent. Poor hunched compelled undesiring female. No student had written about that, the sadness of the facial configuration of the bee. As author and bookseller, Trueblood and I have been in off-and-on e-mail communication since her first book appeared. I seem to remember asking her if she wrote poetry, certain that the answer would be yes, and receiving a negative reply. Well, in this novel we have May’s entire life, not merely one hushed, distilled moment, set in the middle of a page with wide margins around it -- and yet I read many poems in May’s responses to life. How many poems are born and die unwritten and unacknowledged in a single mind? Trueblood’s gift to readers of this novel is the preservation of unique moments in her fictional central character’s life. There was also Marry or Burn between then and now, and you can follow the link to my review of that book. You see why I am impatient for the new one? Yes, of course I read new books, too: Every book, if ever to be re-read, must first be read for the first time. Every time I look at it, Facebook asks what’s on my mind (or, more intrusively, how I’m feeling, but I figure that’s none of Fb’s business), and I imply the question myself in the heading material of this blog, but seldom can the answer be phrased in a pithy, cocktail-party one-liner. Even at the bookstore, focused on business, I find my thoughts going in several different directions, seemingly at once. Clearly, the bookstore needs a new sign. See what I mean? That OPEN flag is mine, but does it say bookstore? No. Despite the letters spelling out BOOKS on our door (thanks again to Bill Coohon), the big word LAW right above the door dwarfs our presence. LAW, of course, goes with the word OFFICE, the latter word being above the law office door just next to ours – sigh! -- because ours, you see, is a new door that wasn’t there when the LAW OFFICE sign went up. What can I say? We’re working on it, we’re working on it! Meanwhile, please search us out, because WE ARE HERE!!! WITH BOOKS!!! 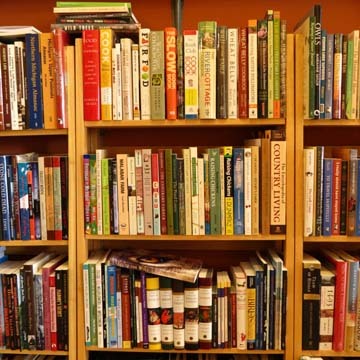 We need more room for gardening, farming, plant, and food books. The first new books that Dog Ears ever carried were nature field guides. I’ve always loved them and never had enough used ones to satisfy me or my customers, who often wanted something specific and/or new. I’ve always loved old books on gardening and farming, too, and have been happy to have customers for them. 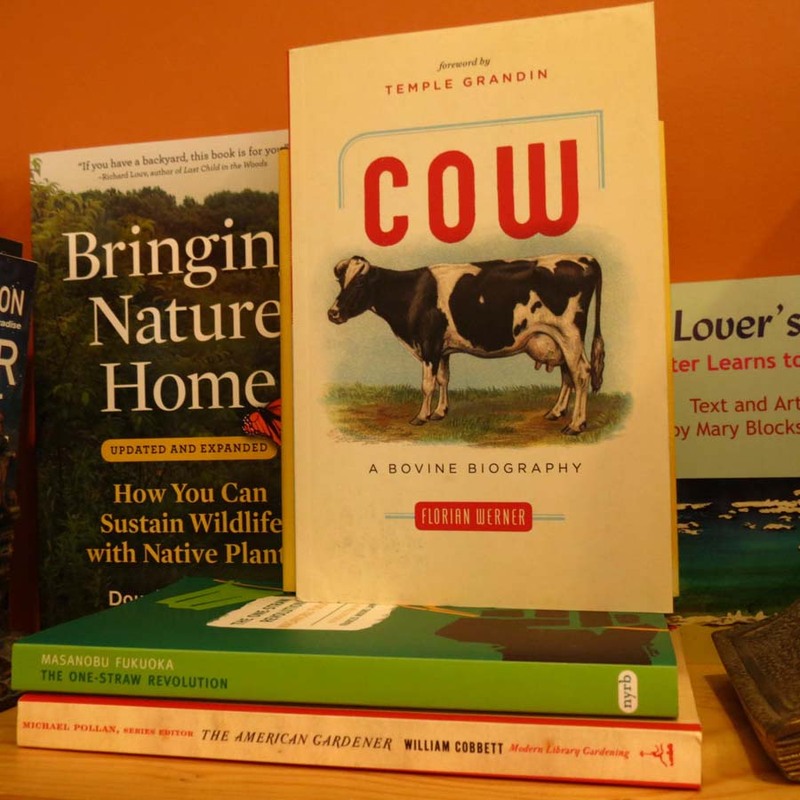 Now with the recent resurgence of interest in homesteading (reminding me of the 1970s), there are also some great new agrarian and urban-agriculture books. So along with reprints of classics, such as William Cobbett’s The American Gardener; Masanobu Fukuoka’s The One-Straw Revolution; and Louis Bromfield’s Malabar Farm, I’m stocking recent titles by Gene Logsdon and Sharon Astyk; books on raising chickens and keeping bees; Attracting Native Pollinators; The Encyclopedia of Country Living, by Carla Emery; The New Organic Grower, by Eliot Coleman; Ron Parker’s The Sheep Book; Florian Werner’s Cow: A Bovine Biography; and more -- and it isn’t enough to fulfill what I see as one of the missions of Dog Ears Books. Sometimes I give in to an odd temptation. There is one new book on the shelf that no one besides me will probably want to read, and though I don’t have time to read it, I may be its purchaser come Labor Day. No, I’m not going to say which one it is. Ordering the latest Khaled Hosseini book, on the other hand, And the Mountains Echoed, was probably a better move. It’s already a bestseller, nationally and regionally. And I have Mardi Link's new memoir back-ordered, so that will be in soon. A friend gave me a lovely 2013 calendar, and on the June page I see “Queen’s Birthday (New Zealand)” on June 3 and “Queen’s Birthday (Australia)” on June 10. Isn’t it the same queen? If so (and I can’t imagine otherwise), why is her birthday celebrated one day in New Zealand and a full week later in Australia? Every time I look at the June calendar, the queen’s birthdays fill me with confusion. And by the way, happy birthday, Big Steve! You and the Queen – in New Zealand, at least – share this special day, so I wish you the very best and suggest you consider wearing a crown. Poet Mary Ann Samyn will be here June 14, Poet-novelist Mark Yakich on June 28 (time TBA), and St. John’s Eve, June 23, I notice, is on a Sunday this year and is a full moon night. Considering having the Yakich event early in the afternoon rather than right at dinner hour (before Music in the Park). Any thoughts from Out There??? The best book, dog, nature, philosophy, etc. blog in the whole, ever-lovin’ world!!! Just kidding. Couldn't resist. Thought of using the underlined for a boastful post heading and then having the text say nothing but “Just kidding.” Probably not the best idea I’ve ever had. That, please note, I did resist. That (see above) isn’t all that’s on my mind, by a long shot, and you probably wouldn’t want to hear it all, anyway, but if you miss my cranky side, hop on over to one of my other blogs -- or just wait for the next post on Books in Northport, because you never know what direction my thoughts will take -- because I don’t know ahead of time, either. It's spring, after all, on the cusp of summer. Whose mind isn't a little all over the place these days? Robin stays focused. Me, not so much.